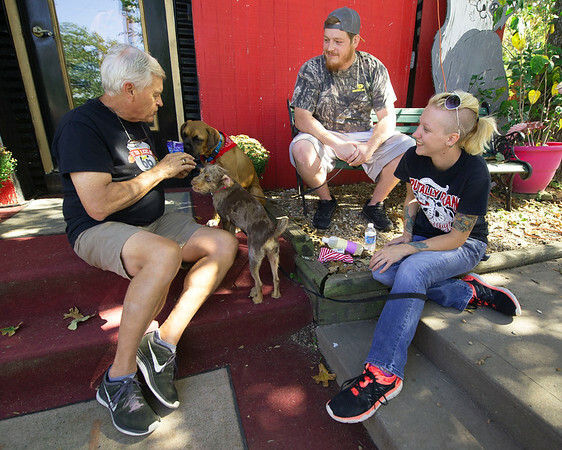 From the left: Greg Sims, of Fido Friendly magazine, visits with Robert Martin and Jessi Webb, of Golden Paws Pet Resort, during a fundraising stop on Tuesday. Sims is in the midst of a 15-stop nationwide tour from Los Angeles to Chicago to help raise money for no-kill shelters. Also pictured are "Daisy Mae." front and "Johnny Cash." both former rescue dogs.